Harry N. Abrams, 9781419709470, 240pp. "A glorious tribute to Octavia Butler’s masterpiece. Extraordinary." "Kindred is a perfect candidate for the graphic-novel medium—Damian Duffy’s taut adaptation and John Jennings’s tense, electric renderings vibrate throughout, pacing and containing, then pushing every ounce of discomfort to the forefront. Comics and science fiction exploit their greatest shared strength by illuminating the mundane that surrounds us, allowing any reader to critique and process our world with new vision." "Wonderful. Captures the essence of Octavia Butler’s vision even as it demonstrates the superlative skills of Duffy and Jennings." The timeliness of this release is important to note, as it revitalizes unresolved discussions around what it means to be a woman of color in America. Plus, the sense of frantic movement created by the artists’ colorful, layered outlines is a very cool touch. "Together, Duffy and Jennings manage to condense Kindred into 240 pages that are respectful of Butler’s original work while also feeling like a distinctly new story at the same time. In exchange for some of Butler’s scene descriptions, the book offers up a richly rendered, raw take on Dana’s experience, heavy with thick lines and blurred movement conveying her existential disorientation." "Butler’s original novel is a powerful commentary on how the past informs the present and how we engage with both. But this adaptation makes an even more vivid statement about black Americans’ relationship with history. The kinetic lines feel urgent, messy, and visceral. The colors for scenes set in the present are muted while the colors of the past are vibrant, almost like a bright wake-up call to reality." "This graphic novel adaptation beautifully retells the story…"
"This adaptation of the classic science fiction/neo-slave narrative novel by Octavia E. Butler is required reading." "The heavily shaded, thick-lined, and rough edged art lends a grimness appropriate to a life of jagged brutality and fearful uncertainty. Both a rewarding way to reexperience the tale and an accessible way to discover it. " "It’s gorgeous, powerful, and makes you realize how resonant this sci fi story, about a young black woman living in 1970s California who’s transported to the South in the period before the Civil War, really is." "The story lends itself well to the medium, which makes it easy for writers to contrast narration with dialogue… According to a 2015 survey of Comic-Con attendees, half of comic fans under 30 are women. 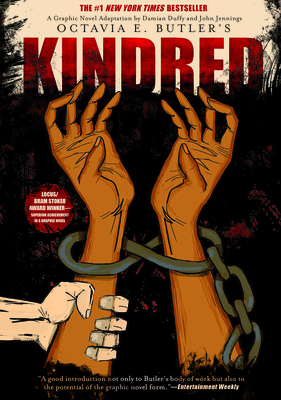 In graphic novel format, Kindred provides a voice that can resonate with those readers." "Nearly four decades after its original printing, Kindred remains a valuable story and teaching tool. From its pages, we are reminded of the destructive consequences of prejudice." “If you’ve read Kindred this is a great companion. If you haven’t read it yet, this adaptation is strong enough to stand on its own." "A compelling, masterly graphic novel for all libraries serving teens..."